#1 New York Times bestselling author Joyce Meyer's popular study Bible featured in gray Euroluxe binding; with practical commentaries, articles, and features that will help you live out your faith, is now available in the New Amplified Version. In the decade since its original publication, The Everyday Life Bible has sold 1.1 million copies, taking its place as an invaluable resource on the Word of God. Simultaneously, Joyce Meyer's renown as one of the world's leading practical Bible teachers has grown, as she continued to study and teach daily. This new edition updates Joyce's notes and commentary to reflect the changes made in the revision of the Amplified Bible which refreshes the English and refines the amplification for relevance and clarity. 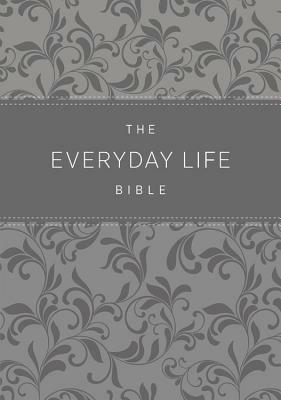 Featured in beautiful, gray Euroluxe binding, the NEW EVERYDAY LIFE BIBLE is now easier to read and better than ever to study, understand, and apply to your everyday life. JOYCE MEYER is a #1 New York Times bestselling author and one of the world's leading practical Bible teachers. Her broadcast, Enjoying Everyday Life, airs daily on hundreds of television networks and radio stations worldwide. Joyce has written nearly 100 inspirational books. Bestsellers include Power Thoughts; The Confident Woman; Look Great, Feel Great; Starting Your Day Right; Ending Your Day Right; Approval Addiction; How to Hear from God; Beauty for Ashes; and Battlefield of the Mind. Joyce holds conferences throughout the year, speaking to thousands around the world.